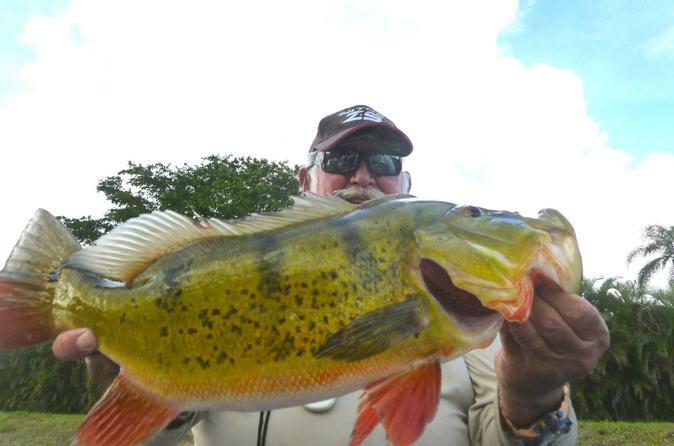 Enjoy a full day on Miami urban fishing tour and reel in colorful, hard-fighting peacock bass. Relax on a modern 21-foot boat guided by a licensed captain while experiencing some of the most unique fishing in the world. You will be provided with right and left-handed fishing rods and reels, all the tackle you can use or lose and all other necessities including safety equipment. Your licensed captain will provide fishing instructions and casting lessons for beginners and advanced techniques for the experts. Your all day Miami urban fishing tour begins at 7am at a centrally-located Miami park. Your charter is suited for all ages and physical abilities so everyone is sure to have a blast. Never worry about rough seas or sea sickness as you fish with ease in the Miami urban canals and lakes of the Miami Airport, which support excellent populations of butterfly peacock and largemouth bass. Your boat will have coolers on board with ice and bottled water to keep you hydrated. There's plenty of space to bring sandwiches or your additional favorite beverage. Alcoholic beverages in cans is permitted are preferred. The fishing for butterfly peacock bass is usually good year-round and it's never out of season. This trip operates on a No Fish, No Pay Policy, so feel comfortable and confident booking on TripAdvisor!